Cole Pierce, "Triangle is the Strongest Shape #37," 2013, oil and acrylic on canvas, 20 x 20"
It’s not that easy to put together a compelling group show of geometric abstraction, not for lack of contemporary engagement with the genre (it certainly has no shortage of practitioners), but because innovative, novel approaches to the dialogue are hard to come by. In “Measurable Inconsistencies,” however, Richard Blackwell, Cole Pierce, and Zin Helena Song, brought together by curator Tyler Blackwell, provide abstractions that deviate from the well-worn course with smart, playful uses of space, perception and texture. In works like Chicago-based Pierce’s "Triangle is the Strongest Shape #23," what initially appears to be flat, uniform patterning is upon closer viewing a shallow but dimensional relief of deep brush strokes and rigid taped off edges. In four sculptures by New York artist Song, the use of painted corners and actual ones confuse the eye. As the viewer moves around the pieces, you are never able to see all the planes from any one angle. Blackwell contributes an installation. 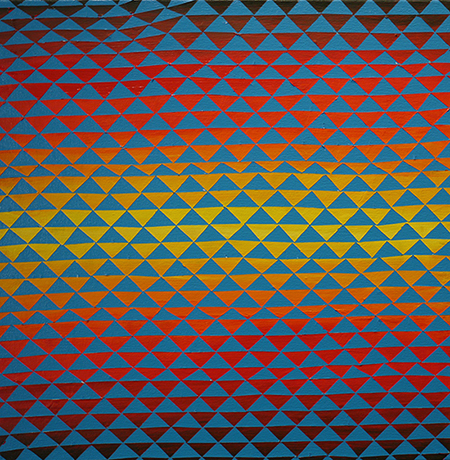 A framed print of a geometric form is covered in a geometric pattern and hung on a geometrically patterned, screen printed wall. This produces commingling notions of fore- and background that exudes an exuberance of form and repetition.